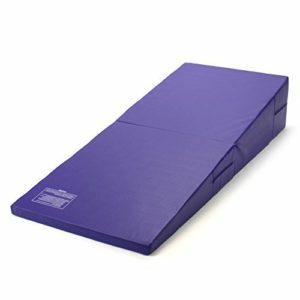 The cheese (or incline) mat is a classic gymnastics staple required for most basic gymnastics practice. There are a variety of companies that produce them, but below we explore the best cheese mats for home use. “Cheese mats” refers to the shape, and not the material. So named for their resemblance to a wedge of cheese. Called both by their cheesy nickname and by the more geometric terminology “incline” mats, this equipment is used by gymnasts during training. Incline mates are needed to practice several middle level maneuvers. They are a staple in any gymnastics practice area, and will be used again and again. Durability and firmness are important attributes of these gymnastics basics. 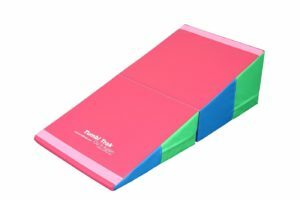 The We Sell Dymnastics Incline Tumbling Mats come in several bright colors, and in folding and non-folding options. 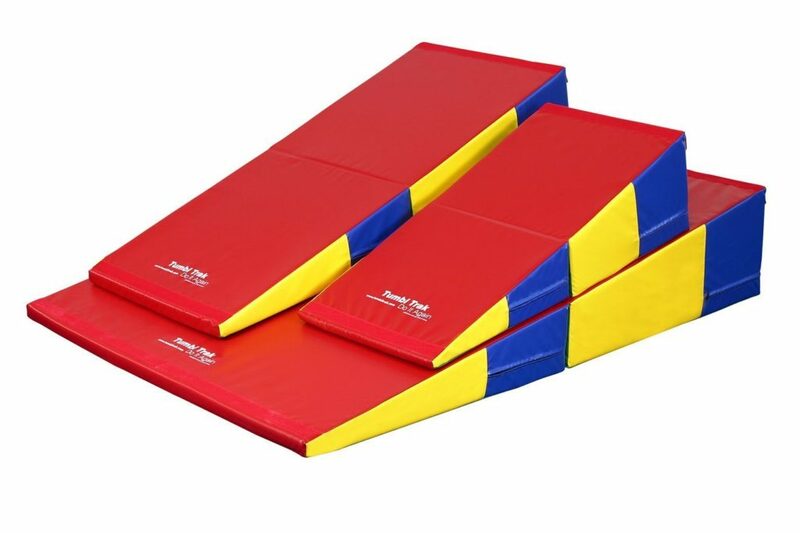 These mats are firm enough to support a variety of practice maneuvers, from back flips to somersaults. Easy to clean due to the vinyl material that covers them, these mats can also be lined up to other incline mats and floor mats to create even coverage of practice areas. These ramps feature velcro on the sides to hold them steady against other gymnastics accoutrements. Generally inclines are used to transition young gymnasts from floor work to aerial and balance routines. 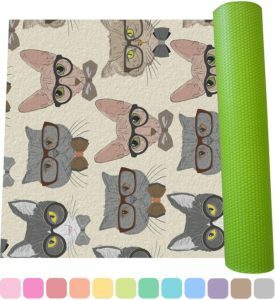 This particular mat is ideal for young gymnasts who are just beginning or transitioning to mid level practice. The company suggests that children no older than 5 years of age use them for gymnastics practice. That being said, the mats do come in four sizes, so you can choose the best one to fit the area being put aside for gymnastics practice. These mats can vary widely in price. Available from around $90 all the way up to $900, they have solid reviews and can withstand the test of time. Unfortunately, their small size means many children outgrow them. 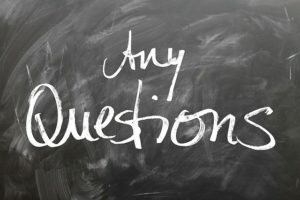 Still, many think they are well worth the investment for the support they offer younger gymnasts during their formative years. The Greatgymats Incline Mat features a lot of benefits that are similar to its peers. 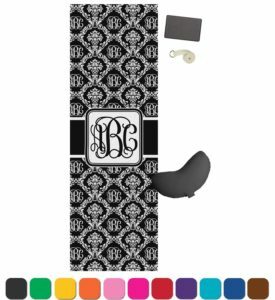 This mat is easy to clean, thanks to its vinyl covering, comes in bright color combinations, and is able to fold for easy storage. However, it is definitely designed more for adjustable practice areas than other incline options. 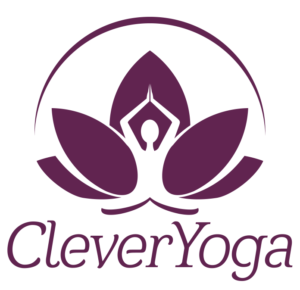 Encouraged for gymnastics and martial art and yoga practice, this mat folds in half for easier storage. It also features side handles so that dragging it out of the way is more simple. 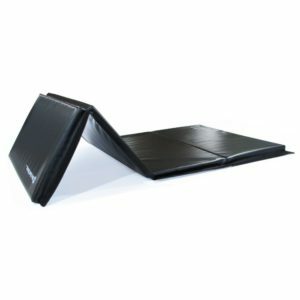 This mat does not offer the firmness that the We Sell Gymnastics mat has due to its bifold design. For storing, the fold sits in the middle of the incline and can signfinificantly weaken the surface if not firmly anchored in place. However, it is comparable in price. The Greatgymats is more easily stored in between practices and retails for under $400 for the most expensive option. This incline mat will also work well for children of a wider age range than the previously discussed cheese mat. 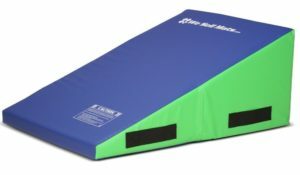 Another bifold mat, the Tumbl Trak Cheese Mat has the same features as other incline mats of this type, with the exception of sturdier connections for harder practice. While inclines are effective on their own for practicing mid level gymnastics, it is important to combine them with other mats for full coverage and routine practice opportunities. The Tumble Trak features velcro with a heavier vinyl flap for safe adherence to other mats. Committed to versatility, this incline is losi designed to fit neatly into a cube shape. This makes it convenient for storage and a variety of practices. Unlike the other mats on this list, the Tumbl trak goes up to a size that works well for young adults. On top of this, it retails for the lowest average price of the models reviewed here. These three cheese mats are covered in grippy vinyl and offer heavy duty foam core support, but are sized significantly differently. 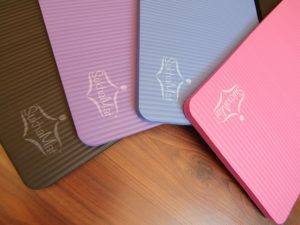 If looking for a mat that is easily stored, it may be beneficial to invest in smaller mats. However, the best cheese mats for you may be one that allows young gymnasts to grow into them as they age. Also keep in mind the potential for evolving practice and the need for different types of mats and equipment. While cheese mats are a safe basic, their ability to pair with more complex gymnastics gear may make or break the right mat for you.